“Circulation” is created for the Lighting Guerrilla’s Luminous Park project. Light installation is positioned under the Barjanica Bridge on the spot where the river becomes slightly widened and the generous, welcoming urban space appears. Barjanica Bridge is designed by architect Jurij Kobe, drawing direct inspiration from the legacy of the legendary Slovenian architect Jože Plečnik. “Circulation” is about movement. Its dynamics relate to the bridge as a place of constant motion. The tale of light depicts a story of the city, the nightscape and the playfulness of the river Gradaščica. 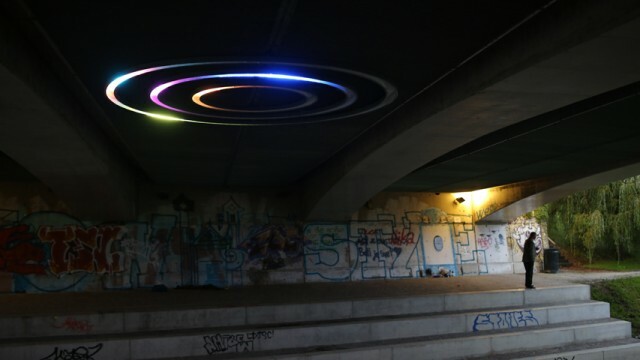 Installation consists of three concentric circles that are integrated in the construction of the bridge. Light reacts to the presence of people approaching the spot, turning from its peaceful state into dynamic light movement.